Time to take a glance at the national scene. It’s the end of January and almost all of the big players have provided track & field fans a taste of what is yet to come for this season. The U.S. Track & Field and Cross Country Coaches Association (USTFCCCA) has provided national rankings in order to assess potential national title contenders for individual events and the team competitions at the NCAA Championships on March 10th and 11th in College Station, Tex. The national rankings are computed scores based off the NCAA Division I Descending Order Lists displayed on Track & Field Results Reporting System (TFRRS.org), in addition to the USTFCCCA Individual Rankings. The top 35 performances are assigned point values that are based on their national ranking (20 points for #1 and decreasing until 0.01 points for #35 in the list) and how competitive those marks are compared to other marks in the same event. Full details about the calculation rationale is available here on USTFCCCA’s website. The first few weeks of the season does allow previous season marks in these rankings as it shows the potential of various athletes/teams in achieving top spots on the national scene. Preseason marks are dropped once the athlete has surpassed that mark during the current season or as we approach the end of the NCAA qualification period, so the calculation will solely focus on 2017 performances. But all we really need to focus on is the following: “The better an athlete performs in their event, the more points they provides to their team in the National Team Computer Rankings. Each athlete’s points are then added up to give a team its total in the rankings,” according to USTFCCCA. So, how do the Ivies fare in their calculator? The Cornell men and Harvard women are the top Ivy squads for each gender. Cornell started off the season ranked 15th in the preseason rankings released on 1/9/17, and then dropped to 22nd in the first formal release of the 2017 (1/23). As of this most recent release, they are ranked 27th. Their scores are still based on preseason marks that were set near the end of the 2016 season (so don’t worry Big Red fans – they will peak at the right time). Meanwhile, the Harvard women jumped up from 34th last week to 22nd this week as Gabrielle Thomas produced a new indoor personal best that places her in the top 10 nationally in the 200m. Check out the full Week 2 release of National Rankings here. Individually, there are 30 entries in the top 30 of the country in their respective events, 11 of which are ranked in the top 15 in the country. For NCAA qualification, the individual needs to be ranked in the top 16 in their respective event, while the relays need to be in the top 12. The bolded lines below are marks that make the NCAA cut, should selection be held today. We still have plenty of competition left, so we expect these rankings to change and (hopefully) more Ivy names will make the NCAA cut. Perhaps the Armory will be kind in this regard? 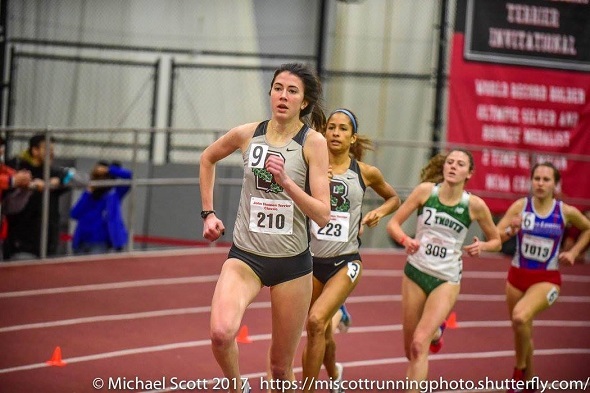 Indoor Heps is at the end of the NCAA qualification period, and we know how a Heps Championships can bring out the best in our athletes. Hope to see you there. This entry was posted on Tuesday, January 31st, 2017 at 9:20 am. It is filed under Athletes, Featured, Spotlight. You can follow any responses to this entry through the RSS 2.0 feed.